Length: 356mm. Image shows painted and assembled kit. 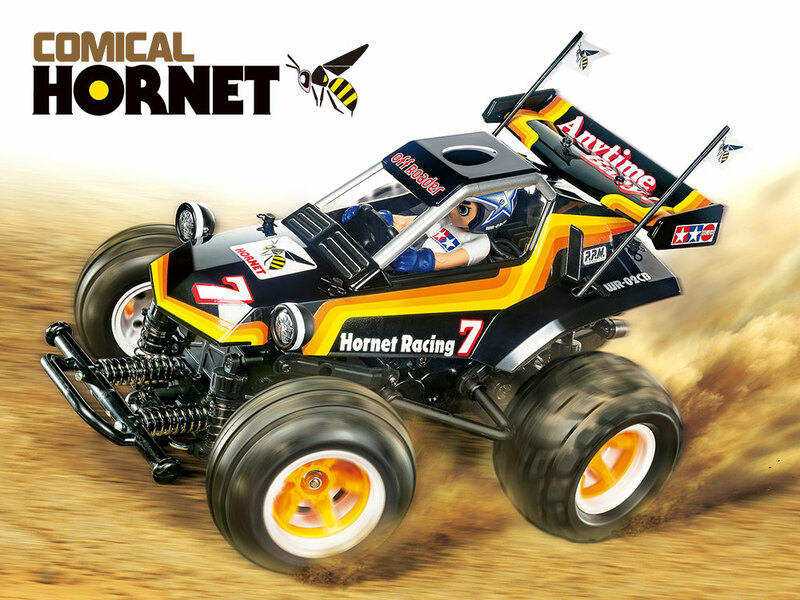 1984 was a year to remember for fans of Tamiya and R/C in general, with the debut of the Hornet; fans from that generation - and brand new fans, too - can now welcome the Comical Hornet, a buggy assembly kit which gives a new twist on the 1984 classic. 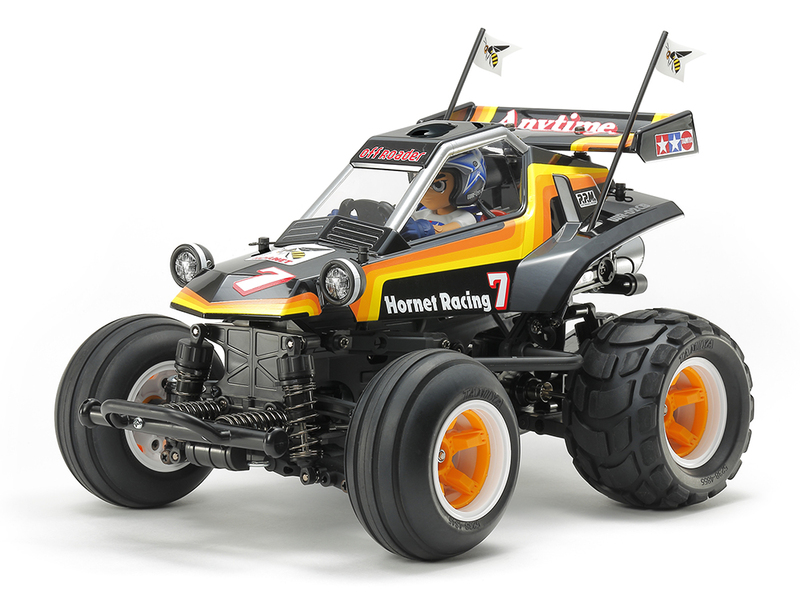 The fun Hornet-inspired body is molded in lightweight and durable polycarbonate, with stickers and masking stickers also included. Light cases are compatible with separately-sold 5mm diameter LEDs. 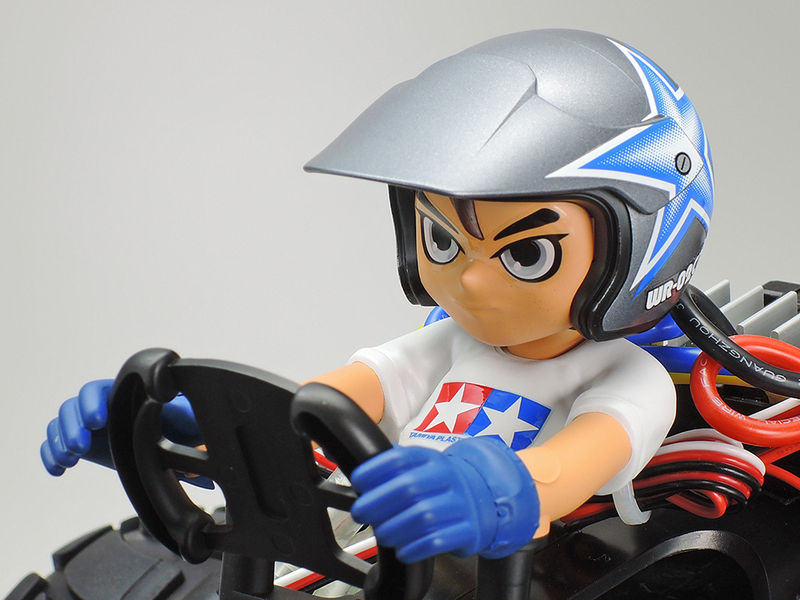 Also included is a T-shirted driver figure, with a choice of visor or chin guard for the helmet, plus stickers for decoration that include no less than five different eye designs. 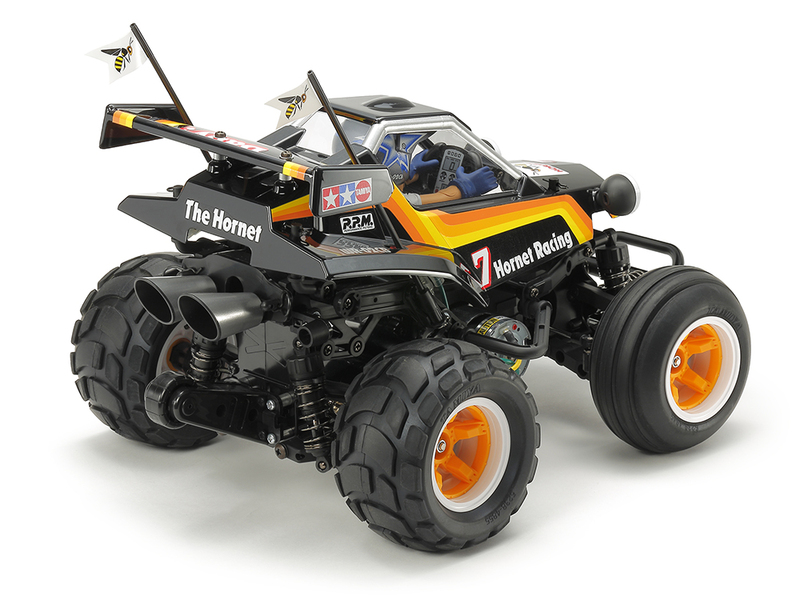 The model is based upon the exceedingly fun WR-02CB chassis. ★Our designers have come up with this comical version of the classic Hornet body, infused with charm. ★This rear view of the model shows off the trademark Hornet rear wing, plus the chunky, comical bubble tires. 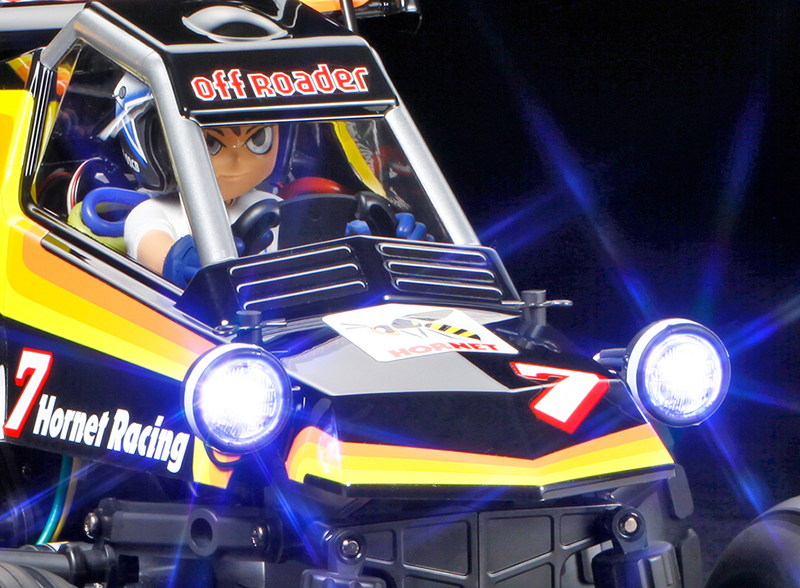 ★Removing the body gives a better look at the fun WR-02CB chassis - wheelies and off-road fun await! 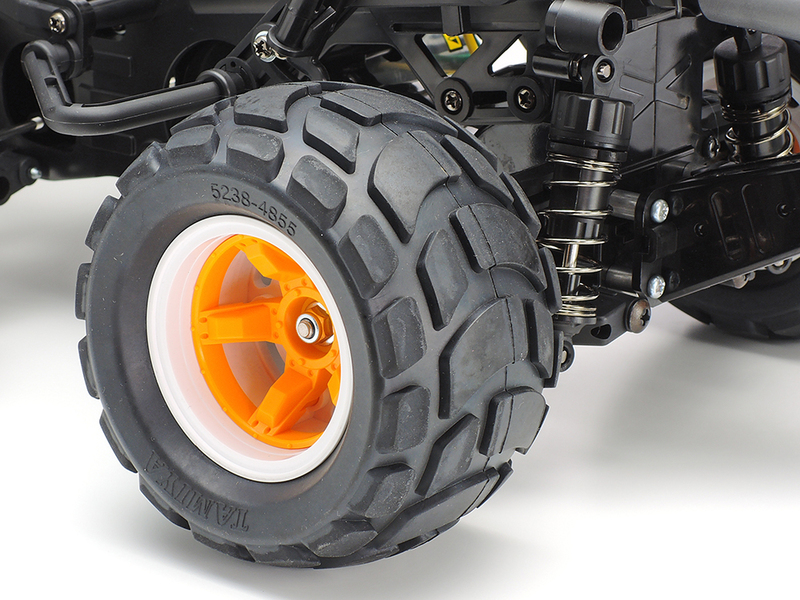 ★A closer look at a round block bubble tire on the rear, as well as a 2-piece wheel with orange rim. 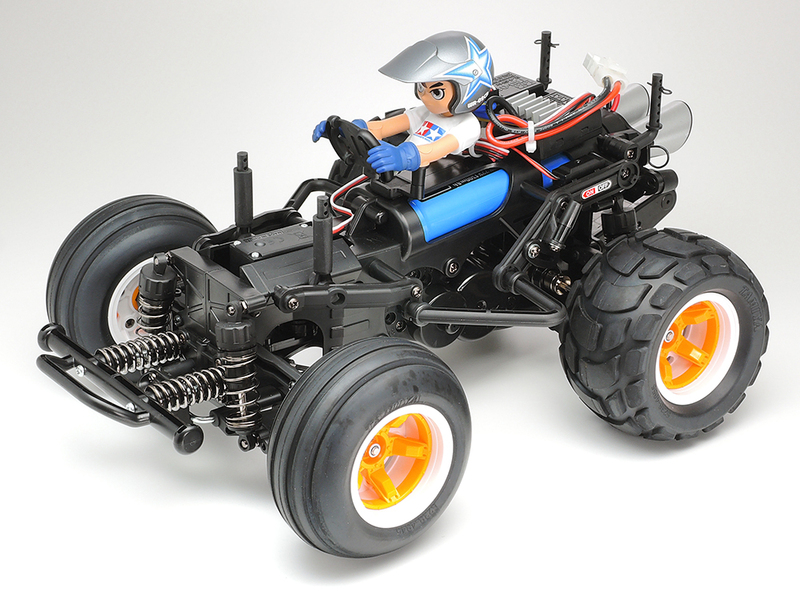 ★Here is the latest Tamiya R/C model figure, which offers an easier paint job thanks to separate face part. 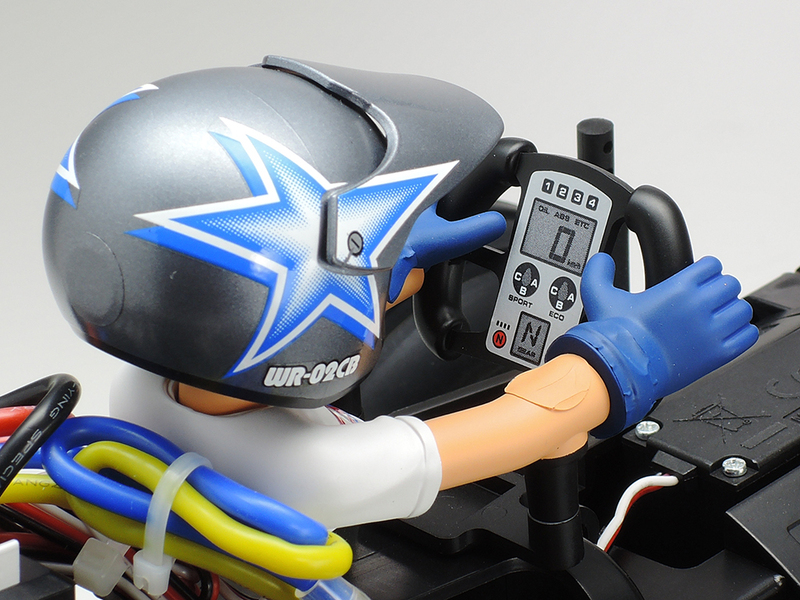 ★A racy steering wheel fits the model's tone, with sticker-recreated instrumentation and display. 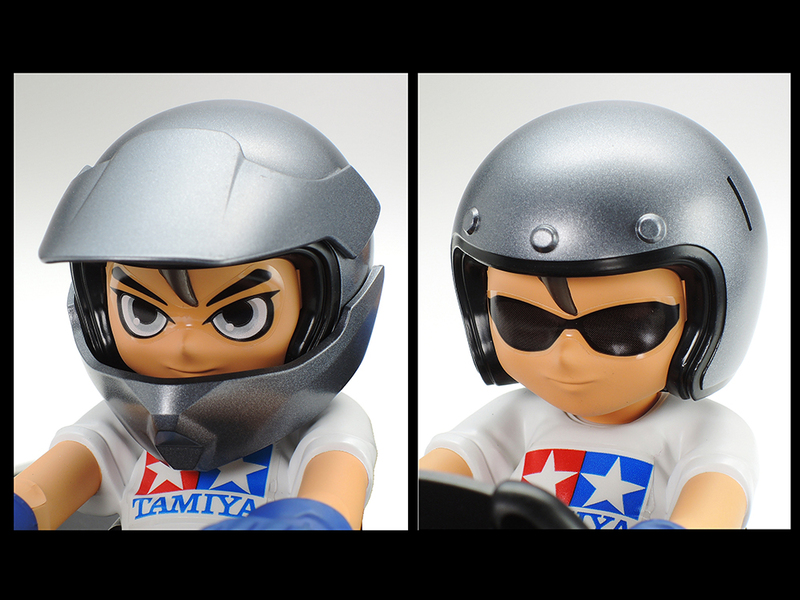 ★Pick and choose from a number of different looks, with different helmet parts and stickers included. ★Take a closer look at the comprehensive sticker sheet for the figure in this image. 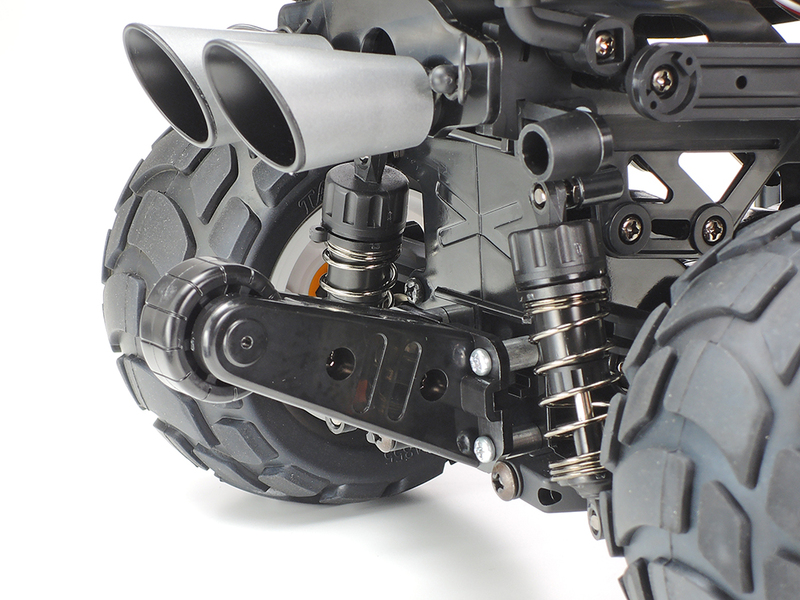 ★A wheelie bar on the rear of the chassis helps the Comical Hornet maintain exciting 2-wheel action. 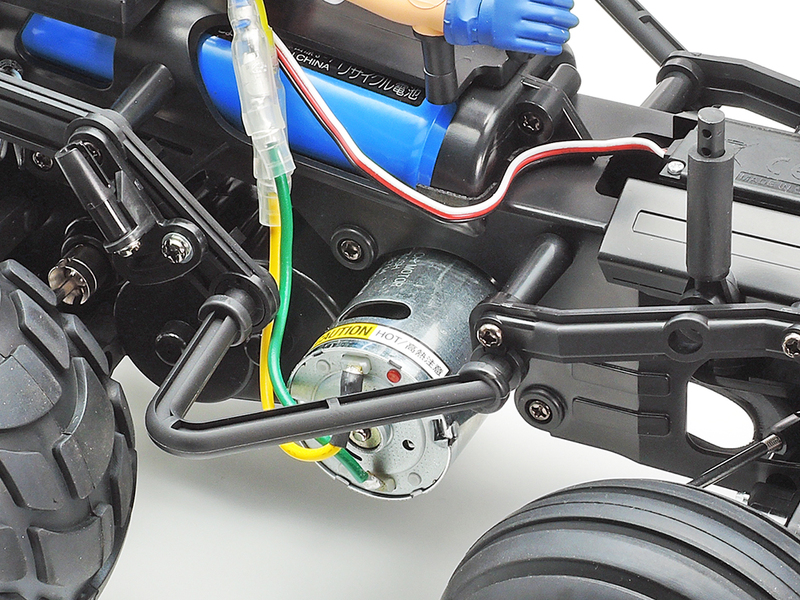 ★The slimline WR-02CB monocoque has its motor in the center with gears routing power to the rear wheels. ★A pre-assembled gearbox unit makes this model a great choice for beginners to the R/C hobby. 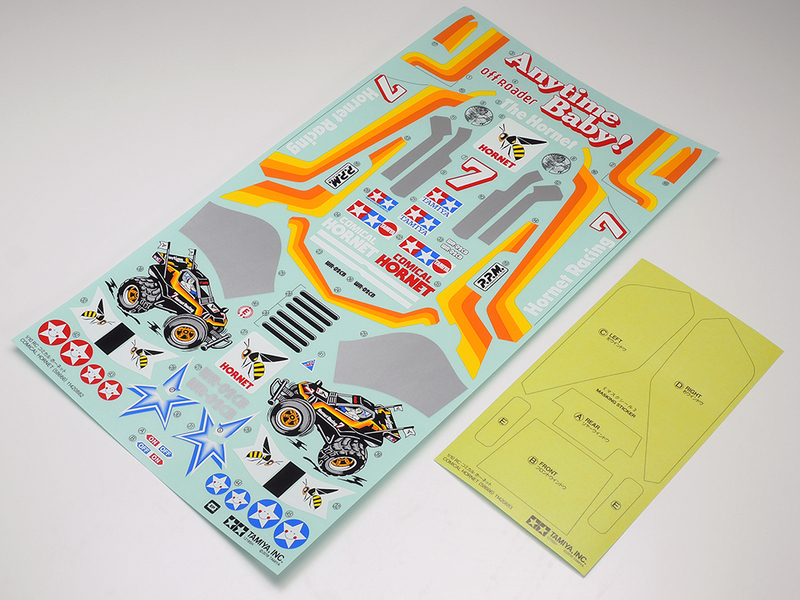 ★Also included in the box are a big sheet of marking stickers, plus masking stickers for use in the paint job. ★Why not fit the light cases (front and rear) with 5mm LEDs for a truly thrilling version of the Comical Hornet? The WR-02CB chassis is an exciting chassis at home on- and off-road, providing smooth driving and the potential for exciting wheelies! 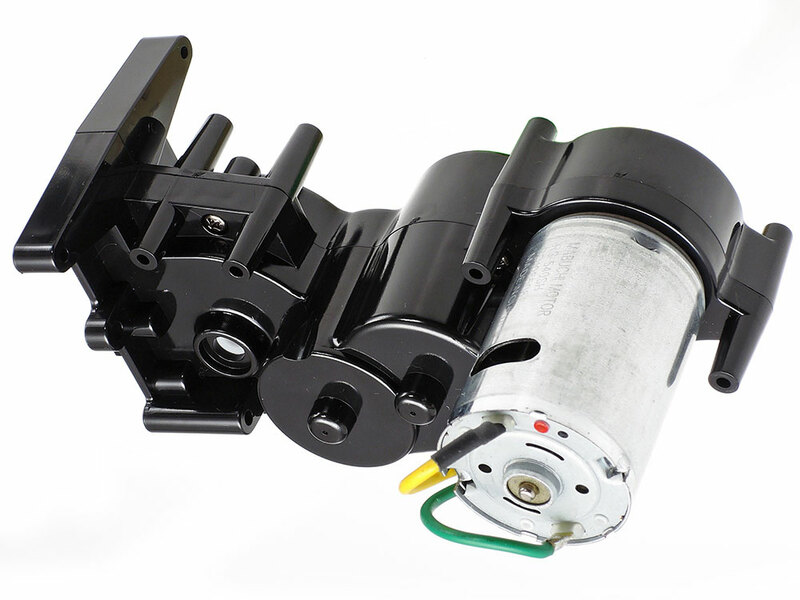 It features a pre-assembled gearbox with motor already attached to save hassle in the assembly process. Long suspension arms and CVA oil dampers make for excellent off-road performance, while underguard and side guards give great protection. A rear wheelie bar helps support the model when it leans back, maintaining a fun wheels-in-the air stance as the model plunges forward. Orange and white 2-piece wheels are joined by bubble tires (front: ribbed, rear: round block) for a fun look and drive. Information is correct as of April 1, 2019. Specifications are subject to change without notice.